Please send us the following two log files to our support via email (support@astah.net). and your .asta file if possible. Changing the Look & Feel may resolve this issue. Go to [View] - [Look & Feel] and change it to something else. HI Satomi Already usable, thank you very much. 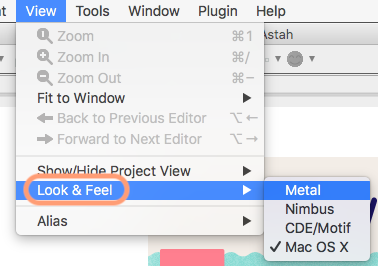 However, this metal style does not seem good Mac OS X, the follow-up will support Mac OS X style it? First of all, glad it's working out now. Not a specific plan on updating L&F, but will create a ticket. This might be another solution to your issue if you prefer working on Mac OS X L&F. 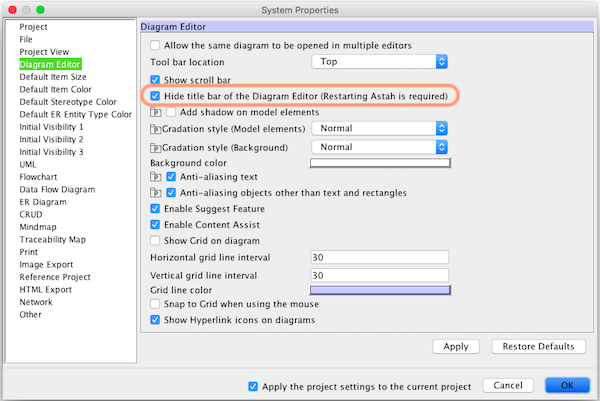 Go to [Tools] - [System Properties] - [Diagram Editor] and check [Hide title bar of the Diagram Editor] option. Restart Astah and switch the L&F back to Mac OS one. Try the Mac OS X L & F based on the solution you provided, but still the same as before; so let's start with metal L & F.
Thanks for your report. Sorry that it didn't work. :( Will let you know when we have a better workaround or new version is available with a fix of this issue.